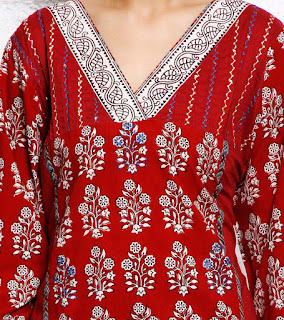 From the diary of a fashion designer : Bagh Prints , the ancient legacy ! I first met Umar Faruk Khatri in the Surajkund Mela which happens every year in the first week of February in Faridabad . This award winner printer belongs to the Muslim Khatri tribe which migrated to the village of Bagh in Madhya Pradesh in 1962 from Sind. A haldi colured bagh printed skirt /lehnga with gota embroidery. 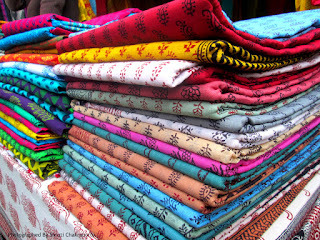 The beautiful vegetable dyed prints in red , yellow , green , indigo , white , maroon , pink immediately attracted me to them. On touching them , they felt so soft that I could not let go of them. Umar , then explained the tedious process of printing which involved soaking the fabric overnight and then soaking it in a paste of raw salt , goat droppings , castor oil and water. The fabric is then dried on a piece of rock in layers and is then ready for printing. After the hand block printing , the fabric is dried and kept aside for a week. Finally the cloth is washed in running water , dried again and mixed with Dhawadi flowers . Once dry the fabric is ready for use. Though the colours used are vegetable dyes , these bagh prints rarely bleed. This is one cotton fabric which I have personally worn and washed a hundred times and it has looked as fresh as ever with no fading whatsoever. I sometimes wonder , how in the world did they discover , invent this form of printing ? How did it occur to them to use goat droppings and other such ingredients to create such soft and durable prints ? It must have taken generations to improve their methods and finally come to this which worked fabulously. Wouldn't you want to be a part of this ancient legacy ? 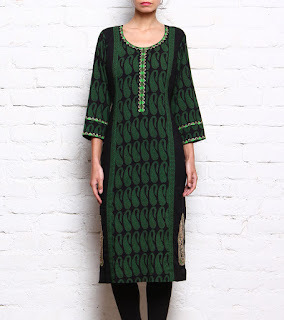 A green coloured bgh printed kurta with tilla and thread embroidery.